When not one but three airlines fail to accommodate an obese passenger trying to get home to receive medical care in the U.S., who is to blame? A New York woman’s husband is suing Delta, KLM and Lufthansa Airlines claiming her death is all on them, after she was unable to successfully get home to the states from Hungary on three separate flights. The 425-pound woman was suffering from kidney disease and diabetes and only had one leg, says her husband, and her condition worsened while the couple was on their annual vacation in Hungary, reports the New York Post. but all three airlines said she was too fat to fly. “All we wanted was to come back home to get her treatment,” he said. She passed away nine days after attempting to board the first of three flights. The man says their travel agent told Delta about her condition and had purchased two tickets for her, and one for the husband. On Oct. 15 they were planning to fly back to the U.S. so she could receive medical treatment from her doctors. But KLM told them after they had boarded the plane that it couldn’t accommodate her weight. “They tried to fit her into the back of the plane, but they didn’t have an extension to secure her,” he said, adding they were already seated when the airline told them to get off the plane. “It appeared on the passenger’s return that it was not physically possible for her to board the aircraft, despite every effort made by KLM to this end. 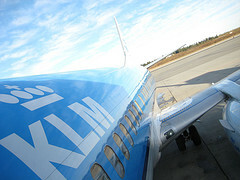 A seat or belt extender did not offer a solution, either,” saida KLM spokeswoman. The couple then drove five hours to Prague to get on a Delta flight that would supposedly be able to handle her as a disabled person, said the man’s attorney. Delta staff claimed the plastic wheelchair they used wouldn’t hold her and they couldn’t put her on a sky-lift elevator. “After the operating carrier in Budapest was physically unable to board [the woman] on its flight, and despite a determined good-faith effort by Delta in Prague, we were also physically unable to board her on our aircraft,” said a Delta spokesman. It was back to Hungary, where the couple called their travel agent to try one more time. This time, a Lufthansa flight said it could take her to New York via Frankfurt. But even with help from the local fire department, the flight crew couldn’t move her from the wheelchair to her three seats, and the captain said they’d have to deplane after 30 minutes of trying to board. Three strikes was it, so the couple returned to their vacation home. The husband says they didn’t trust doctors in Hungary who were unfamiliar with her medical history. She passed away a few days later. CBS News adds that the man is now suing Delta and KLM for $6 million as a result of her death, claiming that the airlines violated laws concerning disabled passengers’ rights. Delta insists it pulled out all the stops to help the couple. A tragic situation, to be sure. But while there are limits to what an ordinary flight crew can do, the woman was able to fly to Hungary in the first place, so surely something could’ve been done in time for her to get home safely.